The egg is nature's fast food. An amazing micro-meal packed with nutrients and an essential ingredient in our kitchens. Eggs may have become an essential ingredient in our kitchens, but are we as comfortable buying eggs as we used to be? A bewildering array of names and choices is available on supermarket shelves. Back Chat helps you solve these problems and sort out any indecision. Parents of young children, carers of the elderly and anybody in between, this is for all of you. Should you still have questions that need answering, do contact me at Back Chat http://www.leslieback.co.za or email me at les@leslieback.co.za . I look forward to many eggstraordinary conversations. Incidentally, which did come first, the chicken or the egg? * Are we as comfortable buying eggs as we used to be? Supermarket shelves are presenting a bewildering array of names and choices. * Some people find the large commercial egg-farming operations, known as batteries, controversial. * Are the idyllic country scenes on the egg box labels accurate? * We need clarification!! We need to know what we are buying!! * There is also concern about eggs and their impact on our health. Eggs contain all nine essential amino acids, making them an excellent source of high quality protein and vitamins, along with iron and other trace minerals. Scientists frequently use the protein in eggs as a standard for measuring the quality of protein in other foods. In addition to their high nutritional value, eggs have other desirable aspects. They’re inexpensive, relatively low in calories, convenient to use, prepare and are simple to eat. Pullet’s eggs: These are hen’s lay that are under a year old and fall under 'small'. Generally only 'jumbo', ' extra large' and ' large' are sold commercially, however hotels for cost-effectiveness use 'medium' sized eggs. Since moderation is the key to good nutrition, great quantities of eggs or of any other food isn’t a good idea. Abstaining from eggs completely however, means missing out on eggs’ positive aspects; which include their high nutrient value. People with high blood cholesterol levels who are sensitive to dietary cholesterol, may need to strictly limit their egg yolk consumption and follow their physician’s advice as to how many eggs they should eat. The Heart Foundation's guidelines are for adults not at risk 3-4 egg yolks per week. For individuals that are at risk they recommend 200 milligrams of cholesterol per day and in an average extra-large egg yolk there is about 210 milligrams of cholesterol, as moderation is the key it will depend on your remaining intake. For highly active individuals, it also depends on the remaining intake and if they are at risk. Some children can have an egg every day and it won't be a problem because they are not at risk. Although often thought of as ‘rich’, eggs are not a high fat food. An average egg contains 5 grams of fat nearly two-thirds of which is unsaturated, the healthier sort and well within a recommended daily limit. Years ago there was a salmonella scare. Salmonella enteritidis is a bacterium than can cause gastrointestinal illness. This is no longer a danger and modern day levels of science and hygiene by commercial farmers have eradicated the threat. For example closed drink systems are used. This eliminates dirt in open troughs, such as food dropped from the beaks of the poultry. These drink systems are also washed daily and fresh water supplied. All utensils used to handle the eggs are kept scrupulously clean. Feed is also changed each day and not merely topped up. The food troughs too are cleaned daily, as amongst many other reasons for contamination, the birds themselves can cause the feed to coagulate by dropping water from their beaks onto the feed and mould may develop. The water must be monitored for any contamination and treated when necessary. The scare originated mainly from private smallholdings, where levels of hygiene were not as stringent. If there is any doubt about safety, people with reduced immunity should take care that the eggs are completely cooked. Thorough cooking will eliminate any bacteria. All cooking utensils used to handle raw eggs should be thoroughly cleaned before being used with other foods. Today, the Green Movement in England demands very high hygienic standards where animal products for human consumption is concerned. Eggs are much better and safer if kept cool, either in the fridge or a cool larder. They should be stored vertically, with the pointed end down in their box. This prevents the air cell, which is in the pointed side, from trying to change ends and push the yolk off centre. Eggs are lined with a membrane, which separates itself from the shell at the larger end of the egg to form the air chamber. The eggs should be kept well clear of anything with a strong smell. It is important to remember that washing an egg makes the egg permeable to smells. The shell consists of a porous substance that is pervious to air, water and smells. Egg whites can be placed in sealed containers and frozen and kept up to 3 months. In order to detect the blood spots, eggs are held against a bright light during grading. Occasionally one is missed. 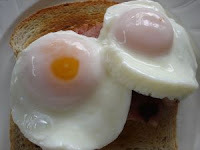 The egg with the blood spot is not harmful to eat. The spot can easily be removed with the tip of a knife before cooking. The rest of the egg remains safe to eat. They are, however, not considered to be Kosher. As an egg ages it gets lighter by evaporation of water through the porous shell, causing the growth of the air space. A fresh egg is heavy and should feel well filled. Hence the old water test for freshness, a fresh egg sinks and an old egg floats. When broken, the white of a fresh egg should be compact round the yellow. It spreads out, as it gets older. Holding it up to the light can also test the freshness of an egg. A very small air chamber indicates a very fresh egg. Typically eggs reach the shops within 2-3 days of being laid. Eggs should be used within 1 month and kept under the conditions described. There is much controversy as to exact specifications as sometimes the descriptions on labels do not necessarily present all the pertinent facts. These are eggs laid by free-range hens, which are allowed to roam outdoors, and feed freely on a certified 100% organically grown wheat based diet. The term ‘Free Range’ refers to those hens that are not confined to large indoor commercially intensive batteries. The batteries cause much controversy. Is there overcrowding? Is it humane? In batteries the hens are kept in wire cages off the ground. In this way the manure falls through the wire, while the eggs roll onto a mechanized gathering belt. The battery operations insist that there is no overcrowding, that the hens have space to preen and flap their wings, and that disease is eliminated as hygiene is totally under control and that the hens are closely monitored. They are fed on Balanced Rations. These rations have to contain a complete diet for the hen otherwise they will not lay enough and therefore will not be cost-effective. Every batch of feed is given a full scale laboratory testing. In the case of Free Range hens, whilst they are allowed to roam freely, they are nevertheless contained in pens for their own security. Pop holes are created to allow the hens access to the outside range where egg nests are provided. The feed contains no animal by-products or fishmeal and the yolks of organic eggs are paler due to the wheat-based diet. The hens do not move on soil, but on chaff and shavings. This is for reasons of hygiene and to prevent disease. Chaff is the product that remains after wheat is threshed and harvested. These are eggs that are laid by free-range hens that are allowed to roam outdoors and feed on a vegetarian diet of grains and pulses. Their feed contains no animal by-products or fishmeal. Again it must be emphasised that they do not walk on soil, but on chaff or shavings. At the end of the day, they come home to roost, as again whilst they are allowed to roam freely, they are contained for their own security. These are eggs laid by hens that are allowed to roam outdoors and feed on a vegetarian diet of grains and pulses enriched with omega-3 fatty acids and vitamin E. No animal or fishmeal is used. The importance of this type of egg is that omega-3 fatty acids are not produced by the human body and are very important to the development of the brain cell and nervous system. Vitamin E is an antioxidant. All the other conditions affecting free-range egg-laying hens remain pertinent. These are eggs laid by hens that feed on a vegetarian diet of grains and pulses. Their feed contains no animal by-products or fishmeal. They too, do not walk on soil and enjoy the same conditions as other free-range hens. It is very important to note that hens can lay eggs without the presence of roosters. These are unfertilised eggs. When hens are young they lay small eggs. These get bigger as they get older. They can lay 6-7 eggs in 7 days. Approximately 300 eggs are layed in a year. This is genetically influenced, as modern breeds of hens are very productive. While fertilised eggs are not sold, they are edible. 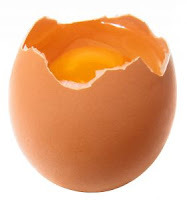 Broken eggs such as those eggs that have fallen and cracked are sold to bakeries, as well as soft-shelled eggs. These are eggs that are just covered by the inner membrane. Hens that lay prodigiously cause this phenomenon. Many liquid egg products are now blended with other ingredients for the baking industry. Prior to pasteurising, blending takes place using other ingredients such as sugar and salt. The egg is then pasteurised. There is a surplus of eggs in this country and these are exported. ANSWERS TO THOSE REPEATEDLY ASKED QUESTIONS. Q. Are drugs and antibiotics used on laying hens? A. 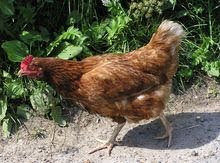 They are not used routinely, but if necessary and only under veterinary advice and control, are administered to the hens and usually in water as water soluble medication is more quickly absorbed. Q What is the scientific name of an egg white and what does it consist of? A Albumen is the scientific name of an egg white. 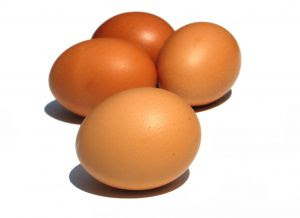 It contains more than half of the egg’s total protein content, a high percentage of water and some minerals. Q Can you keep egg whites that have been seperated? A Egg whites can be placed in a sealed container and frozen for up to 3 months. Q What does an egg yolk consist of? A The yolk provides many vitamins and minerals and excellent nutrients required for our health. However it also contains cholesterol, as previously stated. Q How long can you keep separated egg yolks fresh? Q If one finds oneself with a large quantity of eggs that are not needed directly, how can they be kept fresh? A They can be kept fresh by freezing them. The eggs are broken and whisked lightly and salt or sugar added to prevent the mixture from thickening. Use 5 ml of salt to 420 ml of eggs for savoury dishes and 30 ml of sugar to 600 ml for deserts and baking. Mark the containers savoury or sweet. Q Why does the colour of the yolk vary from a very light yellow to a bright yellow? A These characteristics are the result of the hen’s diet. Wheat based feeds tend to produce a paler yolk colour, while corn based feeds produce a darker yolk colour. Pigments called carotenoids can be added to the laying hens feed to deepen the colour of the yolk. This practice tends to be avoided however, and natural diets adhered to. 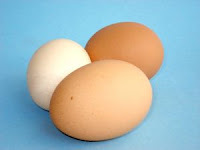 Q Is there any difference between a white and a brown-shelled egg? 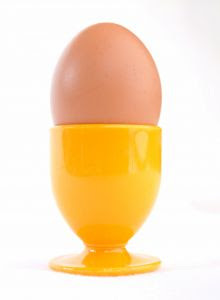 A Egg shell colour can vary, but has no effect on nutrition, quality, flavour, and thickness of the shell or cooking characteristics of the egg. Purely the breed of the hen determines the colour of the shell. 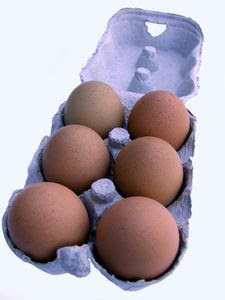 Brown eggs were first popular in the U.K. and then grew popular in South Africa. Today, one very rarely encounters white-shelled eggs. Some stores require that the shadings of brown be very similar in the egg boxes, while other stores do not make these demands. Q How are double yolks formed? A Nearly all double yolks come from young birds in the first few weeks of lay. Usually young hens lay small eggs, however sometimes before the egg laying cycle has established itself, 2 yolks are released to be combined in one large egg. Triple yolks are also known to occur under these circumstances. Q What effect do beaten egg whites have when added to baked products? A Beaten eggs act as raising agents. The secret to successful egg cooking is to avoid high temperatures and long cooking times. An over cooked egg will be tough and rubbery. The light grey colour on the outside surface of the yolk of a hard-boiled egg occurs when the egg is over-cooked, or when there is a high amount of iron in the cooking water. The egg is still safe to eat. Q What are dried, dehydrated or powdered eggs? A These are also known as egg solids. One does not find them on supermarket shelves, such as milk powder for example, but it is available from special sources. Dried eggs involve a further very involved scientific process. They are used where it is not possible to use fresh eggs. Army rations contain powdered eggs for example. Places where there are no refrigerators, perhaps emerging countries receiving aid is another example. When there is a surplus for export, dried eggs are also used. Exporting whole eggs is obviously impractical; eggs are sometimes frozen for export, but this is expensive and takes too much space, making dried eggs an ideal solution. It is perfect for people on the ‘go’, such as explorers and mountaineers, etc. Unopened dried egg products should be stored in a cool dry place below 70º F – about 21ºC and away from the light. Opened containers should be tightly sealed and refrigerated. Boiling: When boiling an egg, leave the egg at room temperature for about 30 minutes before cooking. An egg that is extremely cold will break when placed into boiling water. Coddled Eggs: These are lightly cooked eggs as used in Caesar Salads. The eggs are put in a pan of just simmering water and then immediately removed and allowed to stand for about 8 minutes. When cooking fried eggs, scrambled eggs and omelettes, it is essential not to overcook them. The eggs must always remain moist. Overcooking will produce a tough and rubbery result. Always remove from the heat near the end of the cooking process, while the eggs are still cooking. Eggs will go on cooking even when taken off the stove. Always serve them immediately. The egg is nature’s greatest kitchen miracle. With the uncertainties resolved, you will find that eggs will demonstrate their invaluable and unique contribution to a cook’s endeavours. Many pleasurable hours of cooking and eating will be provided, so get cracking and enjoy!